Star Wars: The Force Awakens is finally here, and there's nothing we can do to stop it. By now, many fans are on their fifth or sixth viewing, most likely, all of which contributes to this blockbuster's record-breaking box office success. Director J.J. Abrams' sci-fi adventure opened with a massive $238 million in its first weekend of release, shattering Jurassic World's record of $208.8 million set just a few months ago. While we wait for more box office records to fall (could Avatar's all-time best record be in danger? ), we thought it would be the perfect time to break down the 11 best scenes in Star Wars: The Force Awakens. To be perfectly frank, if you enjoyed Star Wars: The Force Awakens as much as I did, this list could include almost every single scene. I don't know about you, but I had an ear-to-ear smile plastered on my face throughout the film's 135-minute runtime. But we don't have the time, nor the inclination to break down every scene in this epic adventure, so we're breaking down the best of the best, the scenes that set Star Wars: The Force Awakens apart from the beloved original trilogy, and the much-maligned prequel trilogy as well. Be warned, if you have not yet seen Star Wars: The Force Awakens, there will be MASSIVE SPOILERS revealed below, so read on at your own risk. Star Wars: The Force Awakens not only featured the return of some of our favorite iconic characters, but a slew of new characters as well. The cast of Star Wars newcomers is lead by John Boyega's Finn, Daisy Ridley's Rey and Oscar Isaac's Poe Dameron, along with Adam Driver's villainous Kylo Ren. Mark Hamill (Luke Skywalker), Harrison Ford (Han Solo) and Carrie Fisher also returned to reprise their roles from the original trilogy, although some were seen more than others... and some may never be seen again. The Star Wars: The Force Awakens supporting cast includes Domhnall Gleeson as General Hux, Lupita Nyong'o as Maz Kanata, Gwendoline Christie as Captain Phasma, Andy Serkis as Supreme Leader Snoke and Max von Sydow as Lor San Tekka. Star Wars: The Force Awakens was praised by many fans for bringing back the same aesthetic as George Lucas' original trilogy, chocked full of colorful, and, most importantly, practical characters, amusing one-liners and epic battles both in the sky and on the ground. While many of our favorite scenes are certainly reminiscent of the original Star Wars trilogy, others reflect the unique vision and directorial style of J.J. Abrams. Like it or not, the filmmaker has given a new generation a franchise to call their own, which can still be embraced by fans of the original trilogy. A big part of what made some of these scenes so memorable ties into the secretive nature of the production and the lead-up to the December 18 release. Rumors were flung from distant corners of the Internet, some of which turned out to be true, others patently false, but the sheer amount of rumors only meant that the appetite for new details about this galaxy far, far away was bigger than ever, which translated into the record breaking box office numbers over the weekend. With two sequels and three spinoffs in various stages of development, there is no stopping the Star Wars franchise from rolling over its competition over the next few years. In fact, a recent profile on Disney revealed that the studio plans on putting out one Star Wars movie every year, indefinitely... until fans stop buying tickets. These new movies are just one part of Disney and LucasFilm's massive plans for the franchise, which include a slew of new novels and comic books, which are all part of the official canon, along with theme park plans and much more. Judging by last weekend's grosses, we won't see this franchise going away anytime soon, and now that Star Wars: The Force Awakens is here, the countdown begins for the first spinoff, Rogue One: A Star Wars Story, in theaters December 16, 2016 and Star Wars: Episode VIII, arriving May 26, 2017. But, we're getting ahead of ourselves. Before we start speculating about Rogue One: A Star Wars Story and Star Wars: Episode VIII, lets take yet another deep dive into Star Wars: The Force Awakens, to break down our 13 favorite scenes from this incredible adventure that took us to new worlds and introduced us to a slew of new characters on both sides of The Force. We begin with the villainous Kylo Ren, and the scene that confirmed what many had speculated for the past few years. 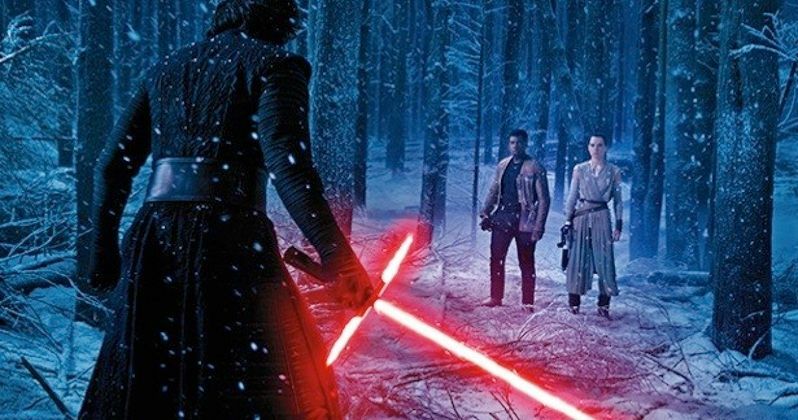 We saw plenty of Kylo Ren in Star Wars: The Force Awakens, but the biggest reveal about this villain is that he is in fact the son of Han Solo and Leia Organa. This reveal was actually teased throughout several scenes in the first half of the movie. In the opening sequence, Lor San Tekka reveals that Kylo's family has a history with the Light Side of The Force, and later Supreme Leader Snoke reveals who his father is. We get a bit of the villain's history in an exchange between Han and Leia, leading up to Han confronting his son, formerly known as Ben Solo, who know goes by Kylo Ren. Unfortunately, details are scant about why Ben turns to the Dark Side, but hopefully more details are revealed in Star Wars: Episode VIII.